That moment, when you arrange to meet a new client about that exciting new project they want you to take on, tells you they’re vegan. Need it really be an awkward one? They don’t eat eggs, dairy, meat, fish or any other animal derived ingredients, they tell you. So that’s your favourite steak restaurant out of the window, right? But hey, stop right there, we’ve put together a list of some of the best vegetarian and vegan cafes and restaurants in Bristol and Bath. From cosy Wi-Fi-fuelled cafes and quirky bars to sophisticated restaurants – these veg-fuelled paradises will not only impress your clients, but will have you running back for more! 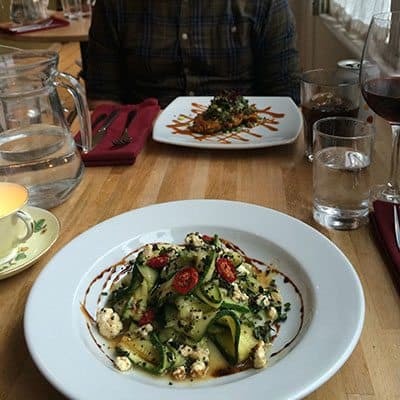 This relaxed but highly rated vegetarian restaurant is situated in the quirky and culturally diverse centre of Easton in Bristol. Maitreya Social offers a varied and seasonal menu that is not only beautifully presented but mouth-wateringly delicious. And, to top it off, they have a selection of excellent vegetarian wines, plus a few real ales and ciders too. For those important meetings, they have a beautifully lit upstairs room available for private bookings. Just make sure you book well in advance, this is a popular spot for meat-eaters and veggies alike. 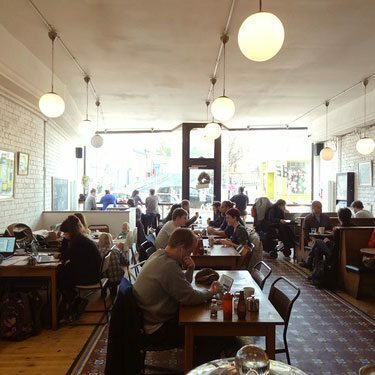 A favourite hang-out for students and professionals alike, with reliable free Wi-Fi and late opening hours, Cafe Kino is a great spot for more informal meetings, catch-ups or remote-working – with great views out onto the creative Stokes Croft area of Bristol. The menu is short and sweet with a focus on local, organic produce – with offerings including homemade falafels, burgers, salads and cakes. Kino also offers proper coffee, loose leaf teas and a small selection of alcoholic beverages. New to Bristol is the modern, sophisticated and centrally located 1847. Situated close to Bristol Temple Meads, Park Street and the bustling St. Nick’s Market, this is a great place to take clients who are new to Bristol. 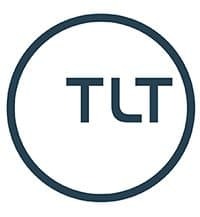 They offer a changing seasonal menu that retains its most popular dishes – such as ‘fish’ and chips made with halloumi and a uniquely flavoured selection of vegan ice-creams! 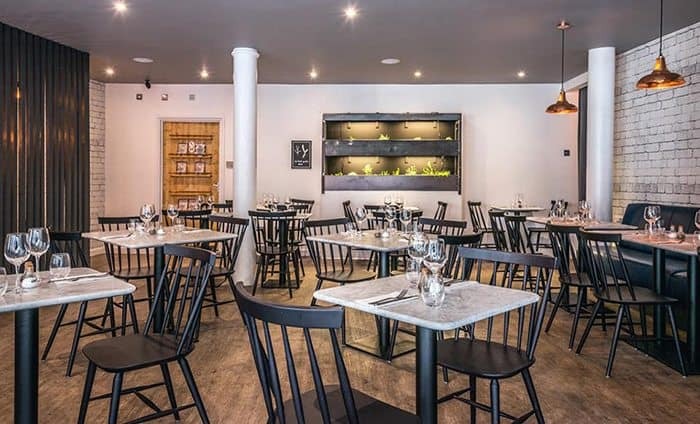 With a private dining space seating up to 8 at the back of the restaurant, this is the perfect place for more luxurious lunchtime meetings, as well as dinner arrangements. Pizza and a tonne of delicious real ales to choose from in a super cool underground bar – what a combo! Previously located in Broadmead, PepeNero Organic has recently teamed up with beer experts the Beer Emporium on the ever-popular King Street. 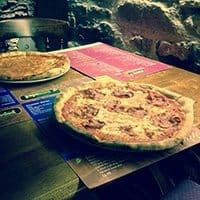 With an amazing selection of vegan, vegetarian and meaty toppings on proper homemade Italian pizza bases, this place will be sure to keep everyone happy. The Beer Emporium’s often electric atmosphere makes it perfect for showing clients what Bristol’s got going-on. Book a table to avoid disappointment. Just want a spot of relaxed lunch? You may also enjoy Roll for the Soul – a fully vegetarian, community-oriented cafe in central Bristol. 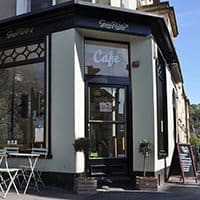 An award-winning vegetarian cafe, located just 5 minutes walk from Bath Spa train station, Green Rocket has literally taken off in Bath. With delicious veggie inspired offerings from breakfast through to lunch and dinner – plus outdoor seating for sunny days… or brave clients – this cafe has it all! The free Wi-Fi on offer also makes this a great all-rounder for remote workers, lunchtime meetings and client dinner parties. If you’re looking to pull out all the stops for your vegetarian client, the Acorn Vegetarian Kitchen is the place for you. 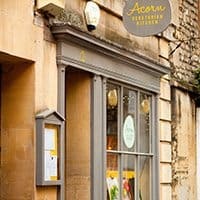 Situated in the historic centre of Bath, just minutes from Bath Abby and the Roman Baths, this restaurant serves gourmet vegetarian and vegan food that has been recognised not only in the Good Food Guide 2016 but also by vegan campaigners Viva, with its Best Vegetarian and Vegan Restaurant award! As well as seasonal ingredients from local artisans, their menu includes wines that can be matched to your dish of choice, unique cocktails and champagnes – adding more than a touch of sophistication to that all-important meeting. Small but perfectly formed, this lunchtime retreat is situated above the Bloomsbury gift shop in the heart of Bath’s central shopping area. 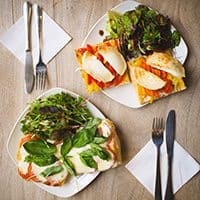 This little cafe is ideal for smaller, more casual lunchtime arrangements with clients, who’ll be sure to enjoy the natural light and views across the city’s famous Georgian buildings. With delicious homemade cakes, coffees, smoothies, wraps and salads, along with free Wi-Fi, you won’t leave disappointed. 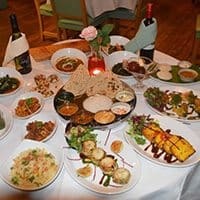 As a 100% vegetarian Indian restaurant, this place has fetched impressive reviews from curry fans across the South West and beyond. And with a separate vegan menu available, your clients will be reassured that their curry is free from animal ingredients. 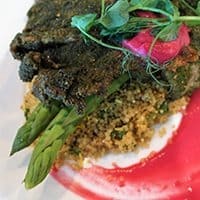 With a wide-ranging menu including traditional thalis and all the trimmings, together with organic wines from small independent wineries, this cosy restaurant boasts views of Bath Abby and is bound to win over any visiting veggie. Looking for something a little more casual? You might like Beyond the Kale, a vegetarian and health focussed lunch and juice bar or the Chapel Arts Centre, a community-focused hub for performing artists with a 100% vegetarian cafe at its heart.